Marissa Mayer, VP, Local, Maps & Location Services at Google announced that they had acquired Zagat today! 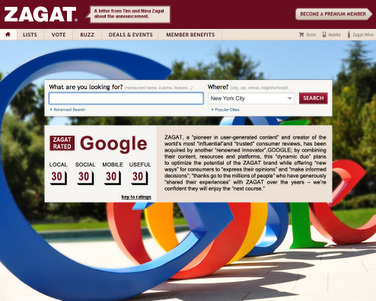 "So, today, I'm thrilled that Google has acquired Zagat. Moving forward, Zagat will be a cornerstone of our local offering—delighting people with their impressive array of reviews, ratings and insights, while enabling people everywhere to find extraordinary (and ordinary) experiences around the corner and around the world. With Zagat, we gain a world-class team that has more experience in consumer based-surveys, recommendations and reviews than anyone else in the industry. Founded by Tim and Nina Zagat more than 32 years ago, Zagat has established a trusted and well-loved brand the world over, operating in 13 categories and more than 100 cities. The Zagats have demonstrated their ability to innovate and to do so with tremendous insight. Their surveys may be one of the earliest forms of UGC (user-generated content)—gathering restaurant recommendations from friends, computing and distributing ratings before the Internet as we know it today even existed. Their iconic pocket-sized guides with paragraphs summarizing and “snippeting” sentiment were “mobile” before “mobile” involved electronics. Today, Zagat provides people with a democratized, authentic and comprehensive view of where to eat, drink, stay, shop and play worldwide based on millions of reviews and ratings. For all of these reasons, I'm incredibly excited to collaborate with Zagat to bring the power of Google search and Google Maps to their products and users, and to bring their innovation, trusted reputation and wealth of experience to our users." More info out here: Official Google Blog: Google just got ZAGAT Rated!